IK Multimedia has expanded its range of iRig Keys MIDI controllers, adding the iRig Keys Pro and a Lightning connector-equipped version of the standard iRig Keys. The iRig Keys Pro features all the same specification as the original unit, but with the addition of full-sized keys across its three-octave keyboard. As with the original, the iRig Keys Pro can connect to both iOS devices - via included Lightning and 30-pin leads - and Mac/PC, with a USB connector included. The Lightning-equipped iRig Pro, meanwhile, allows those with newer iPhone and iPads to connect to the unit without the need for an adapter. The iRig Keys Pro is available now priced at $149.99/€119.99. Check out the press release below for full spec details. IK Multimedia, the global leader in mobile music making apps and accessories for iPhone, iPad, iPod touch and Mac/PC, announced the expansion of its iRig KEYS line with two new products for mobile musicians: iRig KEYS PRO and iRig KEYS with Lightning connector, compact MIDI keyboard controllers with 37 velocity-sensitive keys. Both iRig KEYS PRO and iRig KEYS come with Lightning-connector, 30-pin and USB cables. These allow musicians to connect all iRig KEYS to any iPhone, iPad, iPod touch and Mac/PC model, and provide MIDI control and performance features for Core MIDI apps of all types, such as IK's own SampleTank, iGrand Piano and iLectric piano apps, and its range of Mac/PC virtual instruments. iRig KEYS PRO is a true "plug and play" professional-quality programmable MIDI controller designed specifically for making music on the go with an iPhone, iPad, iPod touch, Mac, or PC. It features 37 velocity-sensitive full-size keys for 3 full octaves plus one note - allowing for realistic-feeling, two-handed playing. 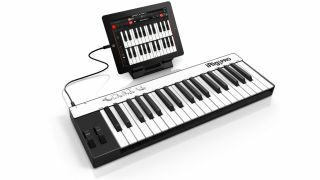 Even with pro features like mod and pitch wheels, illuminated octave and program buttons, 4 programmable "sets" for storing complete setups, and a programmable continuous-controller volume knob, iRig KEYS PRO is 30% smaller than any other full-size key MIDI controller that can be played with two hands. iRig KEYS PRO comes complete with Lightning-connector and 30-pin cables for plugging directly into the dock connector of any iPhone, iPad or iPod touch. A USB cable is included for direct Mac or PC connection. With standard Core MIDI support, you can play any compatible virtual instrument or recording app on your iOS device or computer from Apple's GarageBand to IK's SampleTank. iRig KEYS PRO needs no AC adapter or batteries, it draws its power from the device it's connected to, and it even features an auxiliary mini-USB port to provide it with power during performance, allowing the battery on the mobile device to be conserved. iRig KEYS PRO also has powerful programming features that are useful during live performance and in the studio. Players can program iRig KEYS PRO with different set-ups and store them in one of the 4 "Set" banks. When iRig KEYS PRO is in Edit mode, the user can set the MIDI transmit channel, velocity (touch) response, assign Control Change numbers to the Volume/Data knob, send custom Program Change messages, transpose the keyboard in semi-tones and more. iRig KEYS PRO comes with SampleTank FREE* for iPhone/iPod touch and iPad, IK's award-winning multi-part sound module designed for live performance and recording, and the iGrand Piano FREE* app, a high-quality studio-sampled grand piano sound module. Both apps are expandable with sounds from IK's massive collection of sound libraries, and provide musicians with tools for complete music production. iRig KEYS PRO is also right at home in the studio, and works seamlessly with DAW software, including GarageBand, Logic Pro and many others. It's also perfect for controlling virtual instrument plug-ins such as IK's SampleTank, Sonik Synth, SampleMoog™, SampleTron and Miroslav Philharmonik. For Mac/PC use, iRig KEYS PRO comes with SampleTank 2L**, the full-featured professional sound workstation that includes over 2 GB of professional samples, which cover all instrument categories. iRig KEYS with Lightning connector is IK's new version of the ultra popular iRig KEYS portable mini keyboard and now comes with a Lightning-connector cable for connecting iRig KEYS to the newest Apple devices, including the new iPad, iPad mini and iPhone 5 series. It shares the same powerful features of iRig KEYS PRO but with a more compact build so it only takes up minimal space on your desktop and can easily fit in a backpack or a carry-on bag.